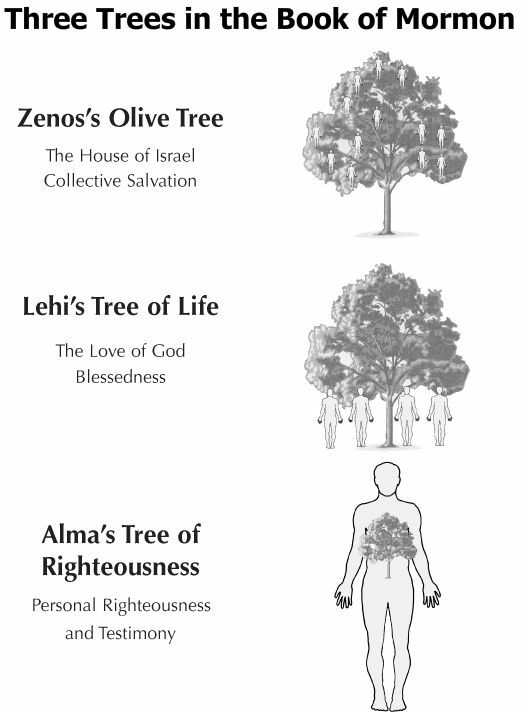 The tree is the primary symbol in three significant sections in the Book of Mormon, showing the development of Nephite theology: Zenos's allegory in Jacob 5, Lehi's dream in 1 Nephi 8, and Alma's discourses on righteousness in Alma 5 and 32. This chart compares the three symbolic trees and the differences in their messages concerning the house of Israel. In Zenos's allegory, the tame olive tree symbolizes the house of Israel as a whole. Groups or individuals are branches or leaves on this tree. Collectively speaking, the Lord does all he can to save his vineyard and will redeem the house of Israel after grafting, or gathering, the branches of Israel together in the last days. When Lehi was physically separated from the house of Israel, and knowing that salvation was not to be found in Jerusalem in his day, the focus of his view of salvation shifted. Instead of focusing on collective salvation, he invited individual men and women to come to a new tree and partake of the fruit of the tree of life, or Christ's atonement, which leads to individual salvation. In Alma's pluralistic society, salvation was portrayed even more as a matter of individual choice. Alma's allegorical tree symbolizes the personal righteousness that grows inside each individual through planting the seed of Christ's atonement and God's love in one's heart.